Mangalampalli Balamuralikrishna (born July 6, 1930) is a Carnatic vocalist, multi-instrumentalist and a playback singer. He is also acclaimed as a poet, composer and respected by all Indian classical musicians for his knowledge of Carnatic Music. At the age of eight, Balamuralikrishna gave his first full fledged concert at a Thyagaraja Aradhana, Vijayawada. Musunuri Suryanarayana Murty Bhagavatar, a distinguished Harikatha performer, saw the musical talent in the child and gave the prefix 'Bala' (child) to the young Muralikrishna. This title has stuck ever since and Balamuralikrishna has been known so. Balamuralikrishna thus began his musical career at a very young age. By the age of fifteen he had mastered all the 72 melakartha ragas and had composed krithis in the same. The Janaka Raga Manjari was published in 1952 and recorded as Raagaanga Ravali in a nine-volume series by the Sangeeta Recording Company. Not merely content with his fame as a carnatic vocalist, very soon Balamurali proved his immense versatility by playing the kanjira, mridangam, viola and violin. He also accompanied various musicians in violin and is also noted to give solo viola concerts. Balamuralikrishna started his career at the age of six. Till date, he has given over 25000 concerts worldwide. His immense versatility in all the fields of music, his mesmerizing voice, his unique way of rendering the compositions helped him to carve out a niche in the Music era. He collaborated with the top musicians in the Hindustani circle and is known to be the first to start the jugulbandi type of concerts. The first of such kind was in Mumbai, where he accompanied Pandit Bhimsen Joshi. He also gave jugalbandi concerts with Pandit Hariprasad Chaurasia and Kishori Amonkar, among others. These concerts made him popular throughout the country and also helped in national integration through music. 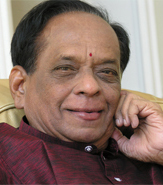 Poet composer and musicologist, Balamuralikrishna has restored the trinity's composition to their original whole. He represents a new era in Carnatic music. Like the galaxy of giants preceding him, he has helped in the preservation of the musical heritage in his own way. He is also known for popularising the Compositions of Sri Bhadrachala Ramadasu and Sri Annamacharya.He also acted in the Telugu movie "Bhakta Prahlada" (1967) under the banner of AVM Productions as Narada wherein, he sang his own songs. He also acted in a few more movies as well. He has recently become increasingly interested in music therapy, and now performs only occasionally. He gave its authorization to S. Ram Bharati to found "Academy of Performing Arts and Research" in Switzerland and is also working on music therapy. He established the 'MBK Trust' with the objective of developing art and culture and for carrying out extensive research into Music Therapy. A dance and music school, 'Vipanchee' is a part of this Trust and is run by his managing trustee Kalaimamani Saraswati. In February 2010, he did a three-day concert in Vishakapatnam, a first in his career. Balamuralikrishna was born in Sankaraguptam, East Godavari District, Andhra Pradesh state. His father was a well known musician and could play the flute, violin and the veena and his mother was an excellent veena player. His mother died when he was an infant and Balamuralikrishna was raised by his father. His father put him under the tutelage of Sri Parupalli Ramakrishnayya Pantulu. Sri Pantulu was a direct descendant of the sisya parampara of Saint Thyagaraja. Under his guidance, the young Balamuralikrishna learnt Carnatic Music. Sangeetha Kalanidhi, Gaana kousthuba, Gaanakalabhooshana, Gaana gandharva, Gaayaka Sikamani, Gaayana Chakravarthy, Gaana Padmam, Nadajyothi, Sangeetha Kala Saraswathi  Nada Maharishi, Gandharva Gana Samrat, Jnanasagara, The Musician of the Century, to name a few. For the cause of National Integration, the Governor of Maharashtra honored him for services rendered. He has been awarded the All India Radio's "Top Grade" for seven different performance areas.Balamuralikrishna has received the National awards such as Padmashree, Padma Bhushan and Padma Vibhushan. He is also the only Carnatic musician to have won Chevaliers of the Ordre des Arts et des Lettres from the French Government. Apart from all these, he has received many honorary doctorates from various prestigious Universities. 1976 - National Film Award for Best Male Playback Singer - Hamsageethe - "Himadri Suthe Pahimam"